I was recently contacted by the folks at StrideBox to review what they had to offer. 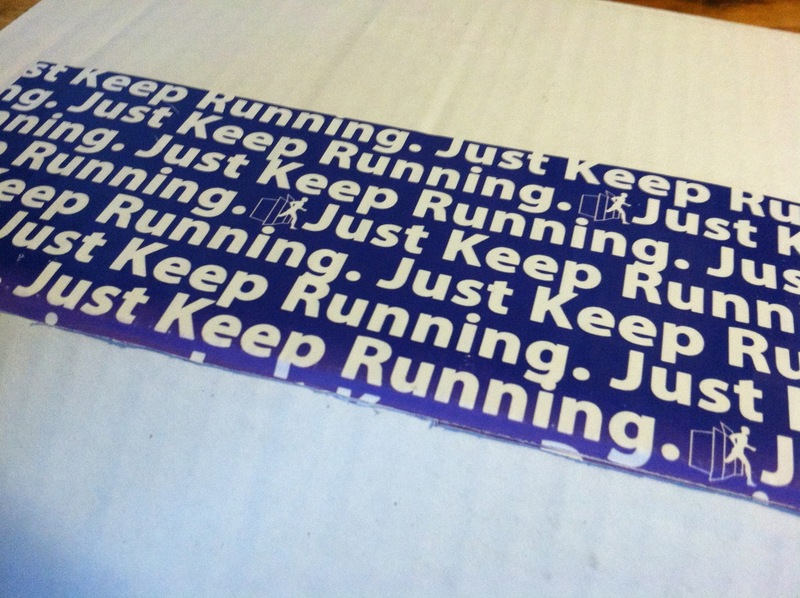 I do like the idea of a monthly subscription especially for runners, so of course I said yes! 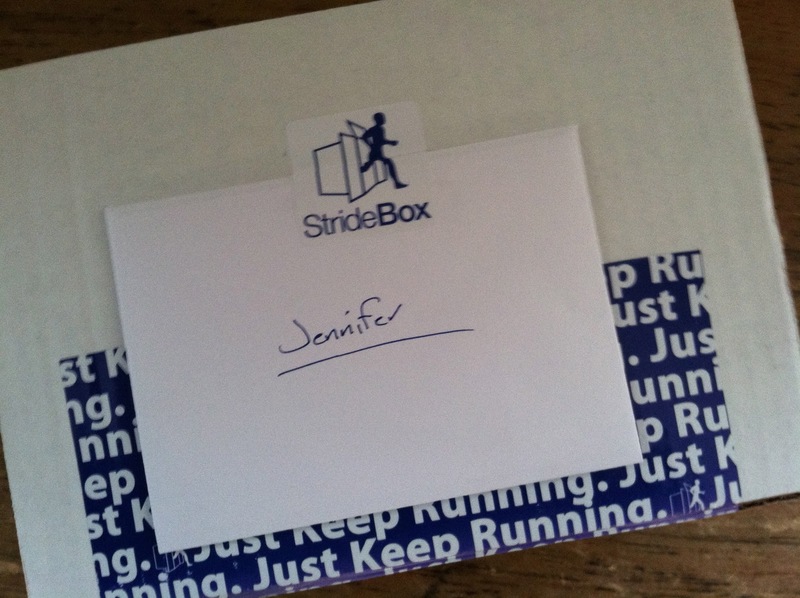 StrideBox is a monthly subscription service that delivers running accessories and nutritional products. A pretty awesome variety of products. GU Chomps, Honey Stinger, Hammer Bar and Fizz, Skratch Hydration Mix, Mazamabar Energy Bar, Locklaces, Doctor Hoy's Natural Pain Relief Gel, On the Go towels (for men), and a StrideBox collapsible water bottle. All of this for only $15? Definitely a great deal. I had everything sitting out for the picture, then Ward walked by and said "oohhh, what can I have?" Seriously? He's going to take my stuff, again? He can have the men's On The Go towels. I don't think I'll share anything else with him. Sometimes having a running husband is a pain because he likes the same stuff I do! A monthly subscription costs $15. While I didn't go an break down the cost of each item, I definitely think this box is well worth the cost and each item in there is useful for me. I've tried other monthly subscriptions and this one seems more tailored to things a runner really likes. Do you want your chance to win your own box? 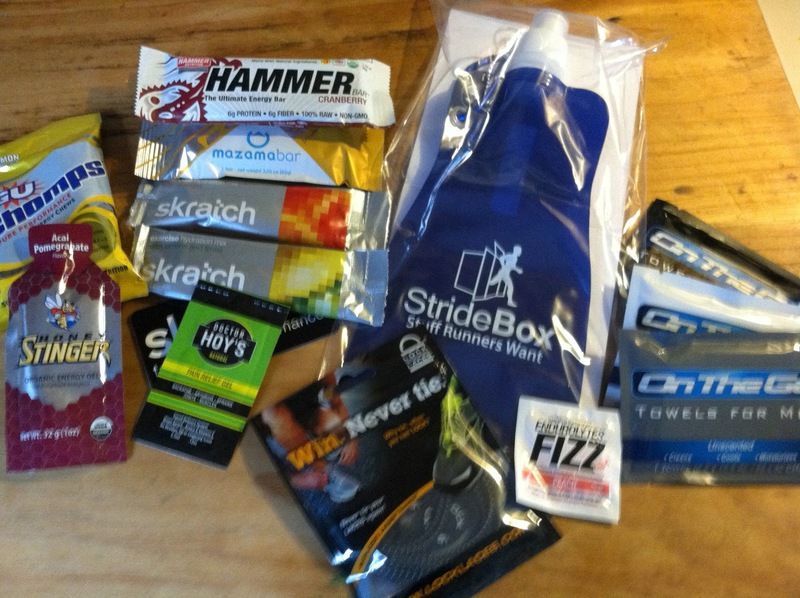 StrideBox has offered one of my awesome readers a chance to win one of their March boxes. To enter - "like" StrideBox on facebook or twitter and leave a comment below on my blog telling me what YOU would like to see in StrideBox. That's it! The giveaway will end on Wednesday, 2/13/13 at midnight. I will choose a winner via random.org and post the winner on the blog on Thursday, 2/14/13. Disclaimer: I was sent a StrideBox free to review but was in no other way compensated for this post. Love that box! Wouldnt mind trying anything in there!! Liked on facebook and twitter. THanks for the chance to win! I would love to try anything in that box! I liked on Facebook and twitter. And I followed them on the twitters and the FB. I liked them on Twitter and Facebook! I would love to see some Vega Products in a StrideBox! I just followed @StrideBox on Twitter (from @poiseinparma). I'm just learning about the company through your post - it's a very cool idea! I think it would be fun to get a foam roller, although it might be hard to fit in the box! I follow them on Twitter:) I would love to see easy to digest race fuel of some kind in the box. Im following both!! I'd love to win this. I'd love to see come clif bars or maybe some appearal like some form of compression sleeve (maybe too pricy). As a new runner, I would like to see some things for beginners...if there is such a thing. Or do we just jump right in? LOL I'm more of a liquid protein girl myself, so that would be something I would like to see. I'd like to see different specialty socks in there!! I liked them on Facebook and Twitter and just ordered my first month with them yesterday. I think products like Knuckle Lights or some kind of night gear would be awesome! Compression gear would be great too, like Autumn said, might be too pricey! I like them on Facebook! This is great, I'd love to see more clothing accessories...socks, fuel belts, head bands, etc! I like them on facebook and twitter too! I would like to see some sort of an accessory item, like a headband, socks, belt or waterbottle. Something that would make this product stand out from all the competitors! Thanks for the awesome giveaway Jen! I followed them on Twitter and would love socks or sweatbands. I already like them on Twitter and Facebook! Oh, and maybe some fun new snacks and supplements!!! I like them on Twitter (@anylit). I'd love to see some strong hair ties and maybe some tech socks. Thanks for the giveaway! I liked them on facebook! I'd love to see different fueling options for long runs. Looks amazing! I follow them on twitter and like them on Facebook. I would love to see different energy gels/chews, that's what I'm always trying to figure out. I love the idea of these boxes as it lets you/compels you to try a variety of items (usually, it seems, as single serving type options) to see what does and does not work for you. I also love the idea of someone else prompting me to try something that I might not otherwise gravitate toward! I liked their facebook page and I would like to see some gu chomps or gels in the box! I'm following them on Twitter. @runjillybean. I would love to see the new Nuun flavors. Liked on FB page & following on Twitter. I just love new products, so anything new would be fun. I like StrideBox on Facebook (Dani Freeman) and Twitter (@ilovepool). I would like to see some kind of gear in the boxes every time - socks, headbands, belt, whatever. I love the variety in this box. Like them on Facebook (Beth Hudson) and Twitter (@hudfamsix). I'd love to see socks, different Nuun flavors, headbands, and different gel flavors.